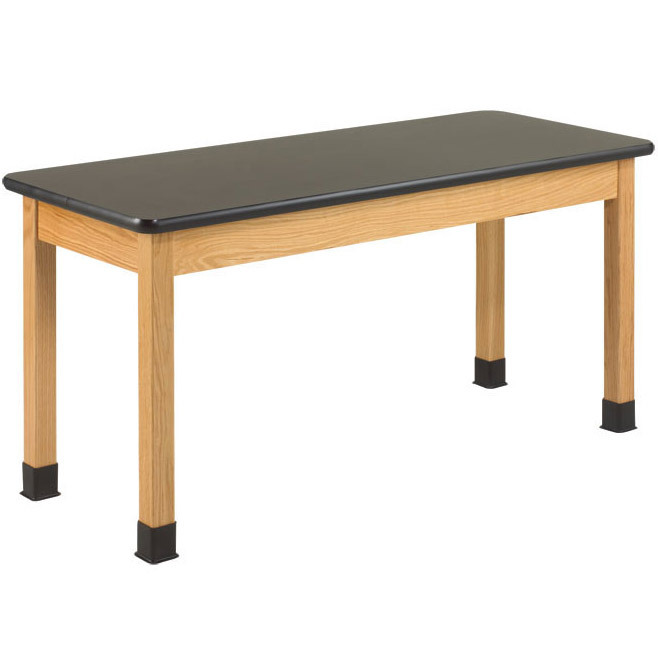 Diversified Woodcraft solid hardwood science tables represent the very best in American made, quality science tables. 1" thick solid epoxy resin table tops represent the very best in science tabletops. 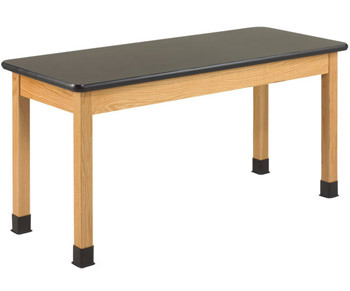 Epoxy resin science tables are ideal for all school levels through college, and industry labs due to its resistance to caustic chemicals and heat. Impervious to moisture, this table features beveled edges and a drip-groove routed along the under side of the top. Truly a heavy duty table, weighing on average 40lbs heavier than standard tabletops. Legs and aprons are constructed from smoothly machined solid red oak with a clear chemical resistant finish. Table aprons are 4-1/2"H x 13/16"D hardwood with heavy-duty 13 gauge steel corner braces that span the full height of the apron. 2-1/4" square solid hardwood legs are attached to apron with heavy duty mounting hardware. All tables are equipped with non-skid adjustable glides for precise leveling and for prevention of rocking on uneven floors. Tables are supplied with black rubber leg boots to protect against chemical spills. Design a quality science lab, or replace existing units with this classic table. Options for all tables include taller leg heights, casters, and electrical outlets built into the apron's side. One electrical outlet is available on the 21", 24", 30", 36", and 42" wide tables - Optional two electrical outlets are available on opposite sides of the tables for the 36" and 42" wide tables (please inquire for custom pricing). Wooden leg braces and stretcher bars come standard when you order optional casters.